The Metal Building Manufacturers association conducted research that shows that metal buildings and roofing systems make up over half of all the most recent one and two story commercial properties in the United States. Because of this large amount of new structures with metal roofing systems, there will be a large demand for commercial metal roof repair and restoration moving forward. For commercial and industrial building owners and managers that want to get the most out of their roofing investment, metal is the perfect choice. You may want to consider a white metal roof system option when choosing to repair your roof. The EPA considers white metal roofing systems to be “cool roofs”. They help reflect a large portion of the sun’s energy away from your structure. You air conditioners and other refrigeration systems will be less stressed. These reflective metal roofing systems are much more energy efficient, They are becoming the system of choice for contractors and architects because of this reason. Metal roofs also have a nice, clean architectural appearance, which is another reason for their high use. Extreme temperature changes causes metal roof structures to expand and contract. This expansion and contraction causes the screws and washers that hold metal panels together to allow moisture to leak through due to their torque tolerance being stressed. At the end and side laps of metal panels, you can find another cause of leaking: tape or caulk seals can shrink, creating gaps in the structure. Rust and corrosion from areas of standing or pooling water on the structure, which eventually becomes rusted, is another main source of leaks. Imagine no more leaks in your metal roofing system. Don’t worry about rusting and reap the benefits from utility-saving, long -lasting and attractive metal roof repair solutions that can add years to your roof’s lifespan. Making singular localized repairs over and over, or paying many thousands of dollars for a total roof replacement aren’t the only options you have. There are some shortcomings to metal roofs, but we have a great solution for them all. they will have leaks that spring up time and again. They could be caused by poor installation practices, gaps that pop up, or punctures that can hit your roof. You can also have sections or panels blown off in high wind conditions, which is usually caused by poor installation practices. If the roof isn’t sloped properly, your metal roof will have ponding of accumulated moisture. 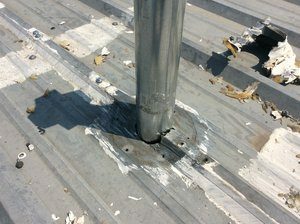 Improper or poorly installed nuts can quickly cause your whole metal roofing structure to break down. There are several viable options available for existing metal commercial roofs that can keep these typical problems from happening and fix them when they do. We have several great services designed to resolve these issues and, at the same time, extending the lifespan of your current metal roof, possibly for decades. The materials and methods we use not only have the history to reinforce this claim, but we also stand behind them with solid multi-year warranties. 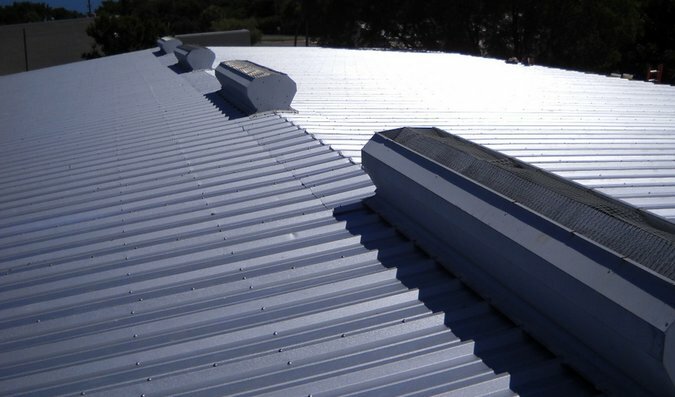 Our products are simple, cost-efficient solutions to commercial metal roof issues. All of our crew members have state of the art training through our manufacturers and experience. 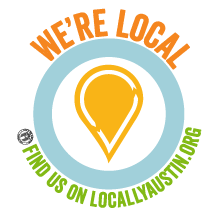 Here at Armadillo Roofing & Exteriors (512) 333-7663, we’re a commercial metal roof repair contractor and metal roof restoration contractor serving Austin, Texas and the surrounding area cities. We will take your old commercial metal roof and use our metal roof restoration services to make it look like new. Give us a call and let us show you what we can do for your roof.